Yesterday I shared some encouraging news about fatal bike crashes in Portland. Despite what headlines and hyperbole might lead you to believe, 2010 was the fifth year since 2000 that there were zero bicycle fatalities on the streets of Portland. 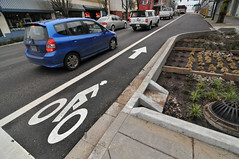 A stormwater, bikeway, and traffic safety treatment? 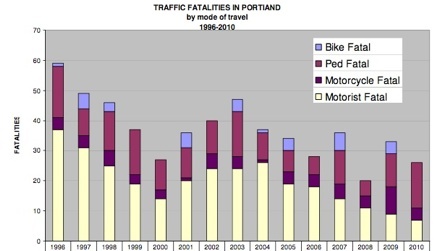 That's good news if you ride a bike around town; but you'll also be glad to know that new data released by PBOT today shows a downward trend in traffic fatalities in Portland across all modes. In fact, 2010 had the lowest number of motor vehicle fatalities since 1925. In the past 15 years, the number of motor vehicle fatalities in Portland has been reduced from 41 to 11. In addition, 2010 had the second lowest amount of total traffic fatalities since they began keeping records in 1925. PBOT says "This continues a long-term, downward trend in fatalities that began in the mid-80s." 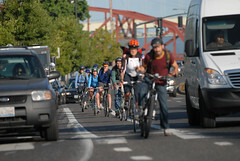 Have better bikeways (and the bike traffic they attract) played a role in improving traffic safety for all Portlanders? It's hard to prove, but it's very likely. Bike traffic as a safety device. "But when there are a lot of bicyclists on the road, according to this theory, drivers take notice. They become more attentive, slow down, pass more cautiously, double-check their blind spots, expect the unexpected. They sense that the road has become a more complicated place, and adjust their behavior accordingly. As a result, the road becomes safer, presumably for everyone." While the overall trend is downward, PBOT data also shows that the number of people killed while walking in Portland has shown a disturbing uptick in the past five years. 15 people died while walking on the streets of Portland in 2010; that's up from just five in 2008 and you have to go back 14 years before there were more (17 in 1996). An overall downward trend is encouraging, and it's likely there will be even fewer fatal crashes in the years to come. While PBOT and the community can always do better (we'll have to push even harder to change the transportation status quo), we have a strong foundation of partnerships, practices, and policies that is saving lives. UPDATE: After we published this story, Mayor Adams and PBOT released an official press release about their 2010 traffic fatality data.